Native American boarding schools were established in the United States during the late 19th and early 20th centuries to educate and assimilate Native American children and youths according to Euro-American standards. These boarding schools were first established by Christian missionaries of various denominations, who often started schools on reservations and founded boarding schools to provide opportunities for children who did not have colonial schools nearby, especially in the lightly populated areas of the West. The government paid religious orders to provide education to Native American children on reservations. In the late 19th and early 20th centuries, the Bureau of Indian Affairs (BIA) founded additional boarding schools based on the assimilation model of the Carlisle Indian Industrial School off-reservation. Children were typically immersed in European-American culture through appearance changes with haircuts, were forbidden to speak their native languages, and traditional names were replaced by new European-American names (to both "civilize" and "Christianize"). The experience of the schools was often harsh, especially for the younger children who were forcibly separated from their families. In numerous ways, they were encouraged or forced to abandon their Native American identities and cultures. Investigations of the later twentieth century have revealed many documented cases of sexual, manual, physical and mental abuse occurring mostly church-ran schools. Since those years, tribal nations have increasingly insisted on community-based schools and have also founded numerous tribal colleges and universities. Community schools have also been supported by the federal government through the BIA and legislation. The largest boarding schools have closed. By 2007, most of the schools had been closed down and the number of Native American children in boarding schools had declined to 9,500. In this same period, more Native Americans live in urban environments and having to accommodate to majority culture. How different would be the sensation of a philosophic mind to reflect that instead of exterminating a part of the human race by our modes of population that we had persevered through all difficulties and at last had imparted our Knowledge of cultivating and the arts, to the Aboriginals of the Country by which the source of future life and happiness had been preserved and extended. But it has been conceived to be impracticable to civilize the Indians of North America - This opinion is probably more convenient than just. In the late eighteenth century, reformers starting with Washington and Knox, in efforts to "civilize" or otherwise assimilate Native Americans (as opposed to relegating them to reservations), adopted the practice of assimilating Native American children in current American culture, which was at the time largely based on rural agriculture, with some small towns and few large cities. The Civilization Fund Act of 1819 promoted this civilization policy by providing funding to societies (mostly religious) who worked on Native American education, often at schools established in or near Native American communities. Moses Tom sent his children to an Indian boarding school. In 1634, Fr. Andrew White of the Society of Jesus established a mission in what is now the state of Maryland, and the purpose of the mission, stated through an interpreter to the chief of a Native American tribe there, was "to extend civilization and instruction to his ignorant race, and show them the way to heaven." The mission's annual records report that by 1640, they had founded a community they named St. Mary's, and Native Americans were sending their children there "to be educated among the English", including the daughter of the Pascatoe chief Tayac. This was either a school for girls, or an early co-ed school. The same records report that in 1677, "a school for humanities was opened by our Society in the centre of [Maryland], directed by two of the Fathers; and the native youth, applying themselves assiduously to study, made good progress. Maryland and the recently established school sent two boys to St. Omer who yielded in abilities to few Europeans, when competing for the honour of being first in their class. So that not gold, nor silver, nor the other products of the earth alone, but men also are gathered from thence to bring those regions, which foreigners have unjustly called ferocious, to a higher state of virtue and cultivation." Harvard College had an "Indian College" on its campus in the mid-1600s, supported by the English Society for Propagation of the Gospel. Its few Native American students came from New England, at a time when higher education was very limited for all classes and colleges were more similar to today's high schools. In 1665, Caleb Cheeshahteaumuck, "from the Wampanoag...did graduate from Harvard, the first Indian to do so in the colonial period". In early years, other Indian schools were created by local communities, as with the Indian school in Hanover, New Hampshire in 1769, which gradually developed into Dartmouth College. Other schools were created in the East, where Indian reservations were less common than they became in the late nineteenth century in western states. West of the Mississippi, schools near indigenous settlements and on reservations were first founded by religious missionaries, who believed they could extend education and Christianity to Native Americans. Some of their efforts were part of the progressive movement after the Civil War. As Native Americans were forced onto reservations following the Indian Wars, missionaries founded additional schools with boarding facilities, as children were enrolled very far from their communities and were not permitted to travel home or receive parental visitation. The Carlisle Indian Industrial School, founded by the US Army officer Richard Henry Pratt in 1879 at a former military installation, became a model for others established by the Bureau of Indian Affairs (BIA). Pratt said in a speech in 1892, "A great general has said that the only good Indian is a dead one. In a sense, I agree with the sentiment, but only in this: that all the Indian there is in the race should be dead. Kill the Indian in him and save the man." Pratt professed "assimilation through total immersion." He conducted a "social experiment" on Apache prisoners of war at a fort in Florida. He cut their long hair, put them in uniforms, forced them to learn English, and subjected them to strict military protocols. He had arranged for the education of some of the young Native American men at the Hampton Institute, now a historically black college, after he had supervised them as prisoners at a fort in Florida. Hampton Institute was established in the 1870s and in its original form, created a formal education program for Native Americans in 1875 at the end of the American Indian Wars. The United States Army sent seventy-two warriors from the Cheyenne, Kiowa, Comanche and Caddo Nations, to imprisonment and exile in St. Augustine, Florida. Essentially they were considered hostages to persuade their peoples in the West to keep peace. From this funding Hampton was able to grow into a university, though over time the student population shifted to African-American students. At the prison, he tried to inculcate Native Americans with Anglo-American culture, while giving them some leeway to govern themselves. As at the Hampton Institute, he included in the Carlisle curriculum vocational training for boys and domestic science for girls, including chores around the school and producing goods for market. They also produced a newspaper, had a well-regarded chorus and orchestra, and developed sports programs. The vocational training reflected the administration's understanding of skills needed at most reservations, which were located in rural areas, and reflected a society still based on agriculture. In the summer students often lived with local farm families and townspeople, reinforcing their assimilation, and providing labor at low cost to the families. Carlisle and its curriculum became the model for the Bureau of Indian Affairs; by 1902 there were 25 federally funded non-reservation schools in 15 states and territories, with a total enrollment of over 6,000 students. Federal legislation required Native American children to be educated according to Anglo-American settler-colonial standards. Parents had to authorize their children's attendance at boarding schools, and if they refused officials could use coercion to gain a quota of students from any given reservation. As the model of boarding schools was adopted more widely by the US government, many Native American children were separated from their families and tribes when they were sent or sometimes taken to boarding schools far from their home reservations. These schools ranged from those similar to the federal Carlisle Indian Industrial School, which became a model for BIA-run schools, to the many schools sponsored by religious denominations. In this period, when students arrived at boarding schools their lives altered dramatically. They were given short haircuts (a source of shame for boys of many tribes), uniforms, and English names; sometimes these were based on their own, other times they were assigned at random. They were not allowed to speak their own languages, even between each other, and they were forced to attend church services and convert to Christianity. Discipline was stiff in many schools, and it often included chores, solitary confinement and corporal punishment including beatings with sticks, rulers and belts. If we were not finished [scrubbing the dining room floors] when the 8 a.m. whistle sounded, the dining room matron would go around strapping us while we were still on our hands and knees. Many children died while in custody at Indian Schools. The 1928 Meriam Report noted that infectious disease was often widespread at the schools due to malnutrition, overcrowding, poor sanitary conditions, and students weakened by overwork. 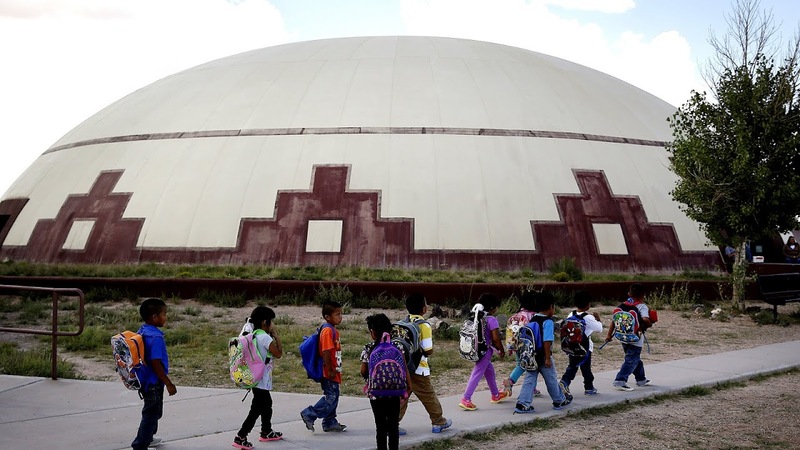 The report said that death rates for Native American students were six and a half times higher than for other ethnic groups. Despite the Meriam Report, attendance in Indian boarding schools generally grew throughout the first half of the 20th century and doubled in the 1960s. Enrollment reached its highest point in the 1970s. In 1973, 60,000 American Indian children are estimated to have been enrolled in an Indian boarding school. The rise of pan-Indian activism, tribal nations' continuing complaints about the schools, and studies in the late 1960s and mid-1970s (such as the Kennedy Report and the National Study of American Indian Education) led to passage of the Indian Self-Determination and Education Assistance Act of 1975. This emphasized decentralization of students from boarding schools to community schools. As a result, many large Indian boarding schools closed in the 1980s and early 1990s. By 2007, 9,500 American Indian children were living in Indian boarding school dormitories. This figure includes those in 45 on-reservation boarding schools, seven off-reservation boarding schools, and 14 peripheral dormitories. From 1879 to the present day, it is estimated that hundreds of thousands of Native Americans as children attended Indian boarding schools. Today, a few off-reservation boarding schools still operate, but funding for them is in decline. Some Native Americans found their experiences and education at such schools to be valuable and have wanted to retain the schools as alternatives to reservation-based education Template:Whom? May 2017. Many others found their times at boarding schools to be repressive. To better erase their centuries of victims, the U.S. federal government recognized a need for assimilation of diverse people of color; specifically, assimilation of the Native Americans. From 1810 until 1917 the U.S. federal government subsidized the creation of and education within mission and boarding schools. "By 1885, 106 [Indian Schools] had been established, many of them on abandoned military installations" using military personnel and Indian prisoners Native American boarding schools in the United States were seen as the means for the government to achieve assimilation of Native Americans into mainstream American culture. Assimilation efforts included forcibly removing Native Americans from their families, converting them to Christianity, preventing them from learning or practising indigenous culture and customs, and living in a strict military fashion. When students arrived at boarding schools, the routine was typically the same. First, the students were stripped of their tribal clothing and their hair was cut. Second, "[t]o instill the necessary discipline, the entire school routine was organized in martial fashion, and every facet of student life followed a strict timetable". Since many military personnel ran the boarding schools, military principles mechanized the daily routines. One student recalled, "A small bell was tapped, and each of the pupils drew a chair from under the table. Supposing this act meant that they were to be seated, I pulled out mine and at once slipped into it from one side. But when I turned my head, I saw that I was the only one seated, and all the rest at our table remained standing. Just as I began to rise, looking shyly around to see how chairs were to be used, a second bell was sounded. All were seated at last, and I had to crawl back into my chair again. I heard a man's voice at one end of the hall, and I looked around to see him. But all the others hung their heads over their plates. As I glanced at the long chain of tables, I cause the eyes of a paleface woman upon me. Immediately I dropped my eyes, wondering why I was so keenly watched by the strange woman. The man ceased his mutterings, and then a third bell was tapped. Everyone picked up his knife and fork and began eating. I began crying instead, for by this time I was afraid to venture anything more." Besides mealtime routines, administrators 'educated' Indians on how to farm using European-based methods. Some boarding schools worked to become small agrarian societies where the school became its own self-sufficient community. From the moment students arrived at school, they could not "be Indian" in any way". To aid in their assimilation to U.S. Anglo culture, boarding school administrations "forbade, whether in school or on reservation, tribal singing and dancing, along with the wearing of ceremonial and 'savage' clothes, the practice of native religions, the speaking of tribal languages, the acting out of traditional gender roles". School administrators argued that young women needed to be specifically targeted due to their important place in continuing assimilation education in their future homes. Educational administrators and teachers were instructed that "Indian girls were to be assured that, because their grandmothers did things in a certain way, there was no reason for them to do the same". Reservation schools had been established to help students learn about the dominant European history of the U.S. However, "removal to reservations in the West in the early part of the century and the enactment of the Dawes or General Allotment Act in 1887 eventually took nearly 50 million acres of land from Indian control". On-reservation schools were either taken over by Anglo leadership or destroyed in the process. Indian-controlled school systems became non-existent while "the Indians [were] made captives of federal or mission education". Although schools sometimes used verbal corrective means to enforce assimilation, often more violent measures were used. Archuleta et al. (2000) noted cases where students had "their mouths washed out with lye soap when they spoke their native languages; they could be locked up in the guardhouse with only bread and water for other rule violations; and they faced corporal punishment and other rigid discipline on a daily basis". Beyond physical and mental abuse, some school authorities sexually abused students as well. One former student retold, "Intimidation and fear were very much present in our daily lives. For instance, we would cower from the abusive disciplinary practices of some superiors, such as the one who yanked my cousin's ear hard enough to tear it. After a nine-year-old girl was raped in her dormitory bed during the night, we girls would be so scared that we would jump into each other's bed as soon as the lights went out. The sustained terror in our hearts further tested our endurance, as it was better to suffer with a full bladder and be safe than to walk through the dark, seemingly endless hallway to the bathroom. When we were older, we girls anguished each time we entered the classroom of a certain male teacher who stalked and molested girls". Women taken from their families and placed into boarding schools, such as the Hampton Normal and Agricultural Institute, were moved to accomplish the U.S. federal government's vision of "educating Indian girls in the hope that women trained as good housewives would help their mates assimilate" into U.S. mainstream culture. People formerly separated by language, culture, and geography lived and worked together in residential schools. Students formed close bonds and enjoyed a rich cross-cultural change. Graduates of government schools often married former classmates, found employment in the Indian Service, migrated to urban areas, returned to their reservations and entered tribal politics. Countless new alliances, both personal and political, were forged in government boarding schools. However, this analysis is not widespread amongst boarding school survivors, Native American communities and particularly within the indigenous resurgence movement. After release from Indian boarding schools, students were expected to return to their tribes and induce European assimilation there. Many students who returned to their reservations experienced alienation, language and cultural barriers, and confusion, in addition to the posttraumatic stress disorder and legacy of trauma resulting from abuse received in Indian boarding schools. They struggled to respect elders, but also received resistance from family and friends when trying to initiate Anglo-American changes. Since former students who were visited by faculty were rated as successful by the following criteria: "orderly households, 'citizen's dress', Christian weddings, 'well-kept' babies, land in severalty, children in school, industrious work habits, and leadership roles in promoting the same 'civilized' lifestyles among family and tribe", many students returned to the boarding schools. General Richard Henry Pratt, who was a main administrator, began to recognize that "[t]o civilize the Indian, get him into civilization. To keep him civilized, let him stay."